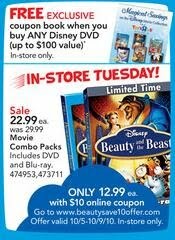 Beauty & the Beast DVD for $2.99 after Rebates! UPDATE: Now it's a MONEYMAKER! See how here. Beauty and the Beast is on sale at Toys R Us for $22.99! There are 2 tabs on the back of Beauty and the Beast so you can do 2 rebates. I bought the DVD at Walmart, you get a free ticket to Tangled.